How does ClassTag's translation service work? How ClassTag utilizes the Google Translate API to support communications in 50+ languages. ClassTag supports communications in 50+ languages, such as SMS to email to Messages. ClassTag utilizes the Google Translate API to make this automagical translation between parents and teachers possible . 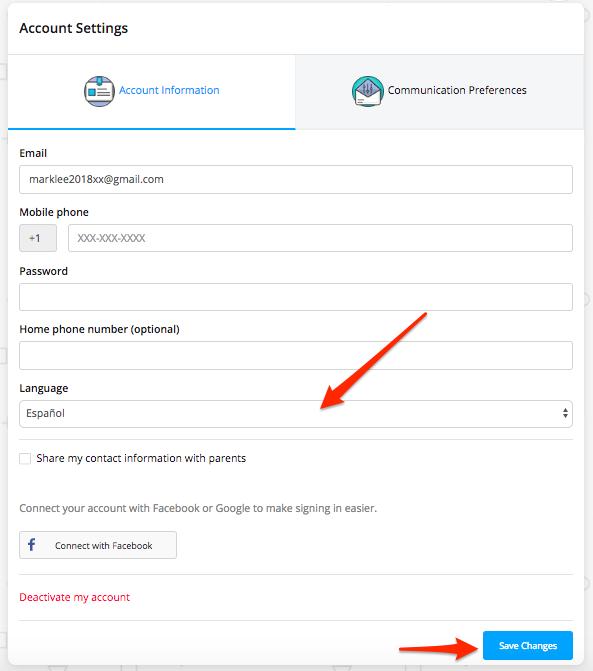 If you're a teacher who needs to communicate with a parent whose preferred language is something other than English, you can communicate with that parent via ClassTag, even if your preferred language is set to English and theirs is not. Through translation, you will receive the parent's replies via ClassTag in English (or your preferred language, while they can write and receive messages via their preferred language. If for some reason you would like to view the communications in the original language, you can do this by hovering your mouse on the translated text and clicking on it. To set your preferred language, please click the three lines on the upper left side of your account and go to “Account Settings. Go to “Account Information” tab and click on the drop-down menu below the “Language” section. Don’t forget to click on the blue “Save Changes” button to save the changes you’ve made. Should the 50+ languages not be sufficient for your community, please inquire about adding the languages at support@classtag.com. We will gladly assist you!